[SOLVED] What is the meaning of &#39;No bundle URL present&#39; in react-native? [SOLVED] What is the meaning of 'No bundle URL present' in react-native? When I run a react-native project, I get a error no bundle URL present , but I don't know what mistakes I do, I was very confused. opens a new terminal and runs the version of node found in the $PATH. If it finds an older version of node not supported by react native, it may give this error. Make sure, the $PATH variable is already pointing to intended version of node(make sure it is Node 8.3 or newer) when a new terminal is opened. That solved the issue for me. Good luck. This may fix the issue. This works for me. It will start up the packager, now don't close this terminal window, in another terminal window run your project. This is the only want that I found to get it working properly. I was connected to the network by cable and wifi on my macbook, disabled wifi and just hit run and it worked! export FORCE_BUNDLING=true worked for me. There was a warning in the console that it was not getting bundled. Be sure that your ATS settings are correct in .plist file. Agreeing to the Xcode/iOS license requires admin privileges, please run "sudo xcodebuild -license" and then retry this command. For my use case, i had to remove node_modules directory and run npm install. ...another reason why this is happening is if you have installed Visual Studio Code React Native Tools but you keep trying to use react native in the terminal: it will work the first time but then it will stop and show you the red no bundle screen. This problem happens when you not allow unsecure connections via localhost, or maybe you tried to accept unsecure connections via http. What a hero this guy is. Saved me and my macbook from jumping out the window! I had changed my exception domain from localhost to my local network address in Info.plist and hence it was not resolving. I added a block for 'localhost' as an exception domain and it worked. I had this same issue. But my problem was my Mac and iPhone were not in same wifi network. So ensure that they are all in same network and rebuild once again. If this is not the case, try the solutions mentioned by other members here. react-native run-ios/android is to build native part then deploy to devices and start app on devices (simulator/emulator/real device). This usually took 3~4 mins to finish. => this is only true for the first time build (fresh build). So that is why we had this issue, the app ran and required thing that did not exist yet. react-native run-ios/android will auto start the dev server for you. 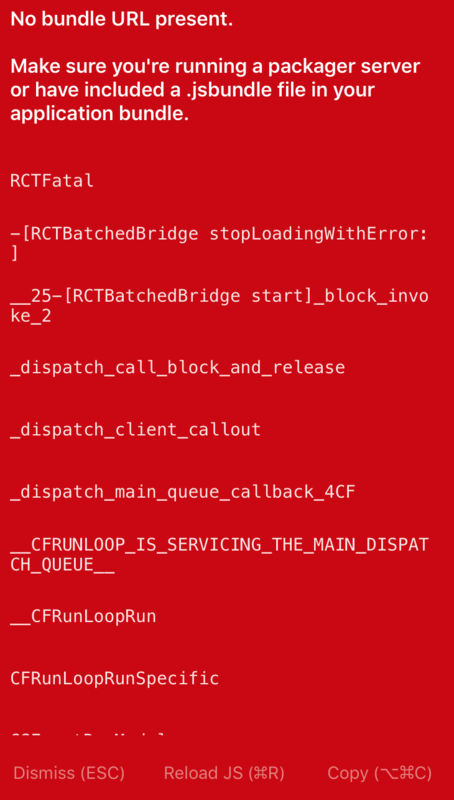 That's why when you ran react-native run-ios/android right after react-native init <app_name>, everything ran well. (because auto start feature and the time was took for fresh build as state above). Other "removing" solutions worked because they forced rebuilding. Time used on this answer was relative to my machine => may different on others. another thing that working for me , is to open the project in xcode, and then clean and build it. usually it reruns the packaging server and solve the problem. It's because your client cannot reach your packager server. If you are not come from China, or your VPN setting is already 'Auto Proxy Mode', I suggest you shut down your packager server and try again. I'm working with RN 0.49.5. I've tried lots of methods, but no one works. Finally i worked this out. It's simple and easy. Main idea is to change the localhost to 127.0.0.1, but it's not where the RN tells you. It's in RCTBundleURLProvider.m#- (BOOL)isPackagerRunning:(NSString *)host. Changes of code: oc - NSString *host = ipGuess ? : @"localhost"; + NSString *host = ipGuess ? : @"127.0.0.1"; This is ok for simulator. If it's device, just change the ip address to your machine's. Most of the cases this problem occurs when the DNS lookup / IP lookup fails to find localhost. Try adding the localhost ip to your etc host file. After migrating to a brand new computer, this was what I needed. TY! I have found the easiest/quickest way to bypass this is to exit the app within the simulator (2 x Cmd + Shift + H) and re-launch. Any idea WHY that works? That did the trick for me. Closing the currently running React Packager terminal window, and then re-running your iOS project from Xcode should work. Say that you run npm install -g react-native-cli in node v6.9.5. The problem is, you have multiple versions of node installed via nvm and to install react-native-cli you have switched or installed latest version of node, which is not marked as default node to point in nvm yet. When you run react-native run-ios this opens up another new terminal window in which default nvm is not pointed to the node version where you have installed react-native-cli. Just follow the above setup, I hope that should help. I had the same error and was able to run the app only through Xcode. react-native run-ios did not work. 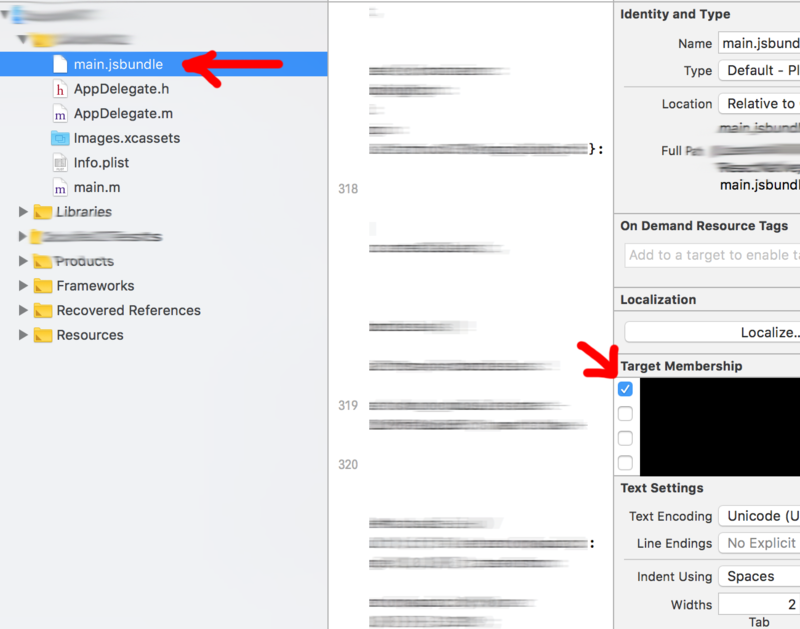 To resolve the issue you need to remove the build folder at YOUR_PROJECT/ios/build/. After this you should be able to run your app through react-native run-ios again. Hope this helps. Alternatively, you could open Finder, navigate to YOUR_PROJECT/ios and delete the build folder. Then run react-native run-ios again. [SOLVED] What is the difference between React Native and React? [SOLVED] What is the difference between using constructor vs getInitialState in React / React Native? [SOLVED] What is the difference between Hot Reloading and Live Reloading in React Native?